Careful management of funds is an essential part of church flower arranging and there are many tricks to make a little go a long way, with stunning results. Creating something special with only a small allowance is challenging, creative and rewarding. Unless you have a large, well-managed garden, I would limit growing flowers for cutting to an essential few. Where money is tight, buy flowers locally when they are in season. What is more important, whatever your size of garden, is the cultivation of shrubs and other plants for foliage; these are invaluable all year round. Many shrubs also have lovely flowers and berries that can be used in arrangements. Shrubs are, of course, not instant and they should be planned with a long-term view. The church garden can also be used as a cutting garden but, again, focus on foliage rather than flowers. Use the flowers that grow in abundance, whether from the roadside verge or the garden. Condition well, keep the water clean and your flowers will look good for longer. Simple flowers can often be best, even though the arrangements shown here contain many exotics bought from florists, a simple vase of cow parsley is always a winner. It is essential to remove excess foliage and to give the cut stems a long drink in a cool place before arranging. 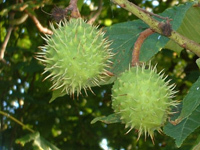 • Horse chestnut: Bowls of conkers (horse chestnuts this side of the pond), together with some of their shells, are lovely on the entrance table in the autumn. • Queen Anne’s lace and the very similar cow parsley abound in spring and look fabulous massed on their own or to give delicacy in mixed designs. • Ox-eye daisy is a delight in summer. Round flowers always dominate a display; these work well with other white flowers. • Foxgloves: These make attractive accents that help to draw the eye into the center of pedestal displays. • Beech: Excellent for outlines for pedestal arrangements. Pick when mature from midsummer onwards. • Ivy: Whether short or long, this foliage is useful for just about every design. • Dock: Grows rampantly throughout Britain. The seeds turn from green in the summer to rich red-brown in the autumn. The seeds stay well on the stem and are useful in both seasons. Dock can also be preserved if picked while still green and provides a good vertical accent throughout the later part of autumn and winter. • Lime: Stripped of its leaves, the branches of green keys last well and provide a wonderful outline for large arrangements in late spring. Their fragrance is an added attraction. • Bulrushes: Take care the seed heads are not too mature or they may explode once they are taken into a warm atmosphere. They can be kept stable by spraying with hairspray. 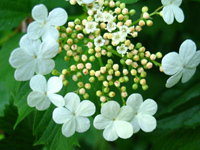 • Guelder rose (Viburnum opulus ‘Roseum’): This native shrub has black berries that give long-lasting color and do not drop easily. • Fir cones: Invaluable. Position a bowlful of cones at the church entrance. Cones can be wired and used together with other plant material in autumn and Christmas arrangements. 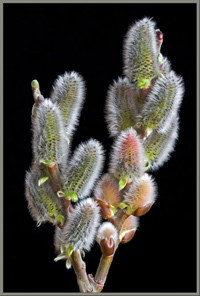 • Catkins of alder, hazel and willow: Display these on their own in spring and use in pedestals at Easter. Alternatively, add a few branches to a bowl of flowering bulbs. It will give the impression of the flowers growing under a tree. 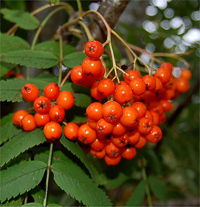 • Rowan berries: Magnificent in summer and autumn arrangements of all sizes. 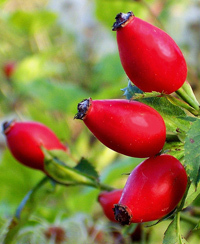 • Wild rose hips: Strip their thorns before using. • Heather can be easily preserved and the flowers will keep color well. 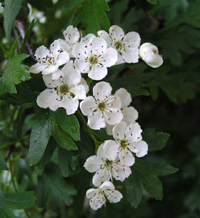 • Hawthorn branches covered with white flowers abound in the spring. • Astilbe grows in profusion in many damp and shady places. 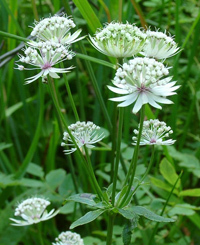 • Astrantia is long-lasting when mature and dries well. Flowers in season are less expensive in the shops and at the flower markets. Think of daffodils and tulips in spring, phlox, peonies and sunflowers in summer, hydrangeas, dahlias and solidago (golden rod) in late summer and autumn and anemones, fragrant narcissi, hellebores and amaryllis in winter and early spring. Use with variegated foliage such as ivy, available all year round, to create impact at little expense. Many a time, I have resisted the urge to wait until dark to ”borrow” a few stems of foliage. I have, however, found that when I knock at the door and ask permission to cut for the church I have usually been granted permission cheerfully. If treated correctly, flowers and foliage will last much longer. Arrange flowers in the medium that suits them best, so, for example, place spring flowers in shallow water (deep water will rot the soft stems), with or without a chicken-wire support. Water the flowers at least once a day if the weather is hot (if not twice) and leave a reservoir in the bottom of the container. Treat the finished display to a fine spray of cool water. Position the flowers out of direct sun. If the display is in a draft, use only robust flowers and foliage. Rapid transpiration caused by cold draughts causes moisture loss and shortens the life of the flower.